Extremist Israeli settlers continued to storm, on Monday morning, Al Aqsa Mosque, heavily guarded by Israeli occupation forces and police. According to Jerusalem sources, about 34 Jewish extremists stormed al-Aqsa mosque, from Mughrabi Gate, wandering in the courtyards where they received explanations about alleged temple. The mosque witnessed the presence of worshipers, students of the Quran, and al-Aqsa guards who approached the settlers and prevented them from touring freely in the courtyards. 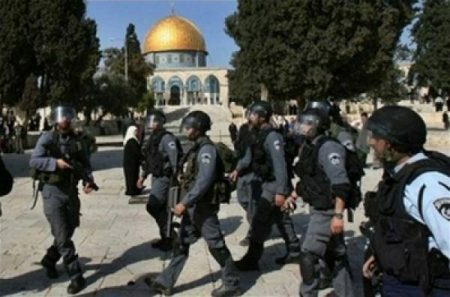 Israeli settlers raid the Islamic holy site on a daily basis, in an attempt to apply their plan to divide the mosque temporally and spatially.